Meridian Ocean Services, LLC seeks to differentiate itself from other subsea survey and inspection providers through its intense focus on innovation and creative deployment of vehicles. 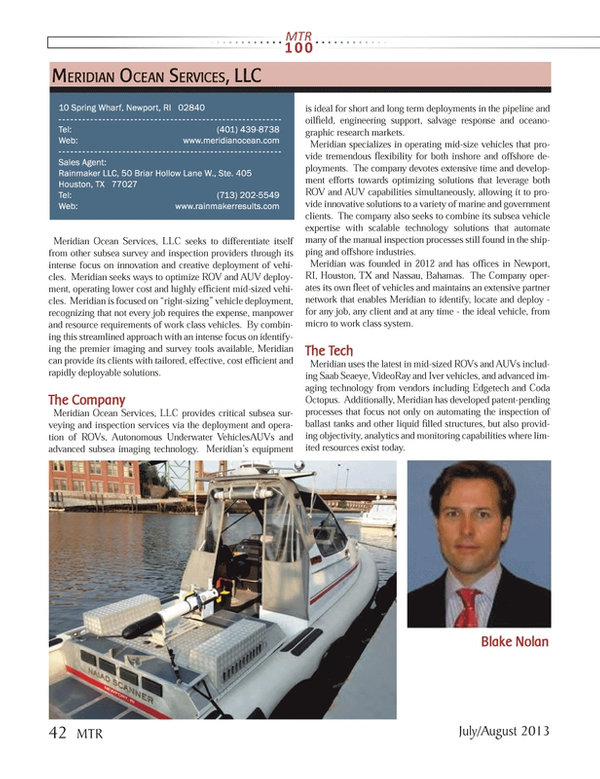 Meridian seeks ways to optimize ROV and AUV deployment, operating lower cost and highly efficient mid-sized vehicles. Meridian is focused on “right-sizing” vehicle deployment, recognizing that not every job requires the expense, manpower and resource requirements of work class vehicles. By combining this streamlined approach with an intense focus on identifying the premier imaging and survey tools available, Meridian can provide its clients with tailored, effective, cost efficient and rapidly deployable solutions. Meridian Ocean Services, LLC provides critical subsea surveying and inspection services via the deployment and operation of ROVs, Autonomous Underwater VehiclesAUVs and advanced subsea imaging technology. Meridian’s equipment is ideal for short and long term deployments in the pipeline and oilfield, engineering support, salvage response and oceanographic research markets. Meridian specializes in operating mid-size vehicles that provide tremendous flexibility for both inshore and offshore deployments. The company devotes extensive time and development efforts towards optimizing solutions that leverage both ROV and AUV capabilities simultaneously, allowing it to provide innovative solutions to a variety of marine and government clients. The company also seeks to combine its subsea vehicle expertise with scalable technology solutions that automate many of the manual inspection processes still found in the shipping and offshore industries. Meridian was founded in 2012 and has offices in Newport, RI, Houston, TX and Nassau, Bahamas. The Company operates its own fleet of vehicles and maintains an extensive partner network that enables Meridian to identify, locate and deploy - for any job, any client and at any time - the ideal vehicle, from micro to work class system. Meridian uses the latest in mid-sized ROVs and AUVs including Saab Seaeye, VideoRay and Iver vehicles, and advanced imaging technology from vendors including Edgetech and Coda Octopus. Additionally, Meridian has developed patent-pending processes that focus not only on automating the inspection of ballast tanks and other liquid filled structures, but also providing objectivity, analytics and monitoring capabilities where limited resources exist today.